So, more specifically, what is HDMI? HDMI - High Definition Multimedia Interface - is actually just a logical progression on top of DVI. The video segment of the HDMI signal is actually compatible pin for pin with DVI, but in a much different package. HDMI improves on DVI by transmitting digital audio on the same interface, adding support for HDCP and also better DDC options for manufacturers. HDMI provides 5Gbps over copper interconnects up to 15 feet - that's enough headroom for a 1080p signal and 8 channel audio. For those who like to do the math, a 1080p raw video signal and eight 192kHz audio channels require less than 4Gbps. So, there is a significant portion of unused overhead built into the HDMI specification. We've seen demonstrations of hooking your DVD player, receiver, and PVR each with a single cable at shows like CES and the word is that adoption of HDMI is going even faster than originally planned. Below, you can see a cross-section of what the 19-pin HDMI cable looks like. The smaller, sturdier cable was designed with laptops and slimmer devices in mind. The DVI cable on the right shows the large difference in size. Right now, HDMI cables, like the original DVI cables, are very expensive. High quality cables easily retail for more than $100 each, although middle of the pack HDMI cables in the one and two meter range can be had for less than $20. Remember the interoperability and quality issues with older DVI connectors on video cards? Since DVI is a relatively loose protocol, manufacturers are not strictly enforced to adhere to design principles. 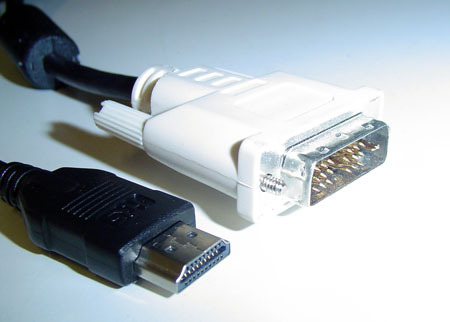 Signal quality on DVI connectors hit a low point in 2001/2002, but fortunately, it seems that awareness of the problem has started to rectify these issues. Since Silicon Image had a significant influence on the original DVI and HDMI specifications, they have taken it upon themselves to set up their own quality control laboratories, PanelLink Cinema (PLC). New devices will go through a very stringent verification process to assure that the next generation interfaces don't have the same problems which plagued DVI. The lab also works directly with Intel's HDCP spinoff licensor, Digital Content Protection, to assure that HDMI-ready devices adhere to the HDCP guidelines. Copy protection is a large facet in the HDMI specification, so it only makes sense that Intel and Silicon Image have so much invested in building trust with the content providers. Today, the largest factor that plagues HDMI in the living room is whether or not devices are actually taking advantage of 8 channel audio. Many of the first generation HDMI ready devices only utilized two channels with the thought that TVs in particular would not need anymore than 2 channels. As a result, many new devices still ship with separate stereo inputs just as they do with DVI, but obviously, the push will be for new devices to drop these inputs in favor of digitally-protected high fidelity capabilities built in the cable specification. Stereo would just be a fall back. Your article (http://www.anandtech.com/multimedia/showdoc.aspx?i...">http://www.anandtech.com/multimedia/showdoc.aspx?i... was written few years back. Considering the fast growing technology, can you please provide a New Article on current HDMI support on Desktop PC's? First of all to those that can't see the advantages of putting audio and video on one cable here it is. If its all in one it has to be sent to an A/V receiver that decodes the audio plays it on your speakers and forwards the video to your display. Hdmi however is a big joke since firewire can carry a lot more audio and has been around for a while, if the video was sent compressed firewire would also be good for that. DVI Dual link has a bandwith of 9.9 gbps , hdmi is a step backwards for video and a step backwards for audio since firewire carries an order of magnitude more channels. Those guys want us to buy the CD/DVD AND the DRM-protected download. They can go stuff themselves. If I buy a CD I WILL be ble to play it on my PDA. Likewise if I buy a DVD, I WILL rip it to DivX and play it on my PDA. They have no moral right to try to stop me. They may have the legal right, but we can always get around that. #50: That's not the point. Jon Johansen should have never been arrested. Nobody should have to go through what he did. And no, most copy protection is not broken purely for the satisfaction of it. Protection is broken both because someone wants to distribute it, and for interoperability purposes (it's my licensed copy; I'll do with it what I ought to be entitled to do). I don't want an integrated sound processor on my video card. I want an standard for internal passthrough. Standardizing on internal Optical or Coax links should suffice. a short, 3 inch cable should be all that is necessary. No, I just don't want it. Also, what will you do with onboard audio? Don’t be fool all they what is control your data. I use Analog connection, and I'm not going to change anytime soon, it is still the best with CRT monitors. But I guess u can connect HDMI up your…. #49- cracking encryption won't be illegal everywhere. Besides, unless they are intending to profit from the crack by selling software which uses it, they don't need to tell the MPAA, RIAA, and other evil entities who it was that broke the protection. Remaining very low profile if there is a risk of legal action makes sense. I will never use HDMI, even when all of the VGA, S-Video, and DVI connections are outlawed.